Whether you take your culture in a glass or you merely like to sit and reflect, you’ll love having this circle of vines in your home. CONs: This will add culture and class to any room. 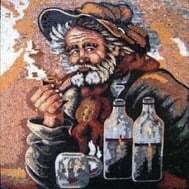 This stunning mosaic artwork is perfect as a mural or floor inlay for any office, bedroom, living room, dining room or retail space. Our mosaics are made from natural marble and stones, naturally resistant to different environments (dry, moist or wet) and weather conditions (frost, sunlight or extreme heat).